Where did the time go??? It seems that not so long ago, I was renting space at NewDance to teach to my one student! 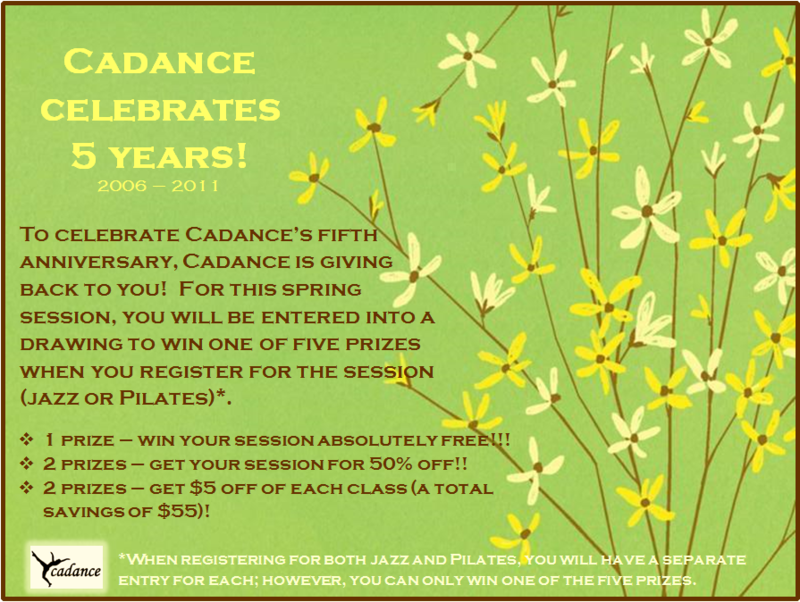 While Cadance remains relatively small, we have now grown over the past five years to include three levels of jazz classes and more recently two Pilates classes! We have performed in three of KlaXson’s productions and at various events in the community. I want to thank all of those students who have passed through Cadance’s doors, whether at NewDance, Ballet Classique on Ste-Catherine, Nyata Nyata, and now at Studio Metronome. It has been a fun journey! I hope to continue to grow, while still giving you personalized attention during classes. To thank you for your loyalty and to welcome new faces into the Cadance family, I have a promotion for this Spring 2011 session. Be sure to sign up for the session so you have the chance to win one of five prizes celebrating our five years! Don’t forget that only two weeks remain of the fall session. If you have missed classes to make up, now is the time to do it. The 11-week spring session begins April 4 and there are some new pricing and payment options. Check out the website for more info. Don’t hesitate to contact me if you have any questions. And if you haven’t checked out Cadance’s new page on Facebook – well, what are you waiting for? Click now and “like” us so you can receive updates via your news feed!